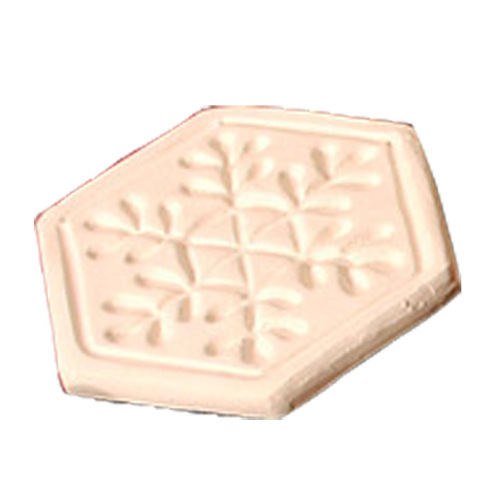 This six-sided stone is made from special porous clay, then fired in the kiln to a beautiful light hue. It features a snowflake design. Use for heating stoves that don't get hot enough to boil water in a steamer OR on your woodstove if you don't need humidification. When you put some drops of StoveScents on your ScentStone, it will slowly volatilize the oil to make a subtle, not overpowering, scent in your room. For gas, oil or pellet stoves, or other low-heat appliances, place a few drops of StoveScents on this decorative ScentStone. The heat of the appliance will cause the highly concentrated oil to release a wonderful aroma. 3 1/2'' diameter stone. Click here for our selection of StoveScent fragrances.